Thirty years ago, Mazda stunned the assembled press at the 1989 Chicago Auto Show with the introduction of an all-new lightweight roadster. At the time few 2-seaters were on the market, so there wasn’t anything quite like the MX-5 Miata and the sporty, diminutive convertible became an immediate hit. Four generations of the MX-5 and dozens of special editions, racing versions and one-off concepts later, the roadster still holds true to its original formula of light weight, rear-drive, top-down driving that brings smiles to drivers’ faces every time they slip behind the steering wheel. With more than 1 million sold, the MX-5 is the best-selling 2-seat sports car in the world, according to the Guinness Book of World Records. What follows are significant MX-5s from the last 30 years, leading up to the special 30th Anniversary Edition debuting at the 2019 Chicago Auto Show. This was the car that started it all — the first year of the first generation. In fact, this actual car is the 14th produced and was on the stand at the 1989 Chicago Auto Show when Mazda introduced its new lightweight sports car, codenamed NA. Part of the MX-5’s success was timing, due to a lack of really fun cars during the 1980s. The new model was a breath of fresh air to driving enthusiasts all over the world. Almost 100,000 MX-5s were sold in its first year of production. As it happens, this Miata was also on the stand that day in Chicago for the roadster’s introduction. 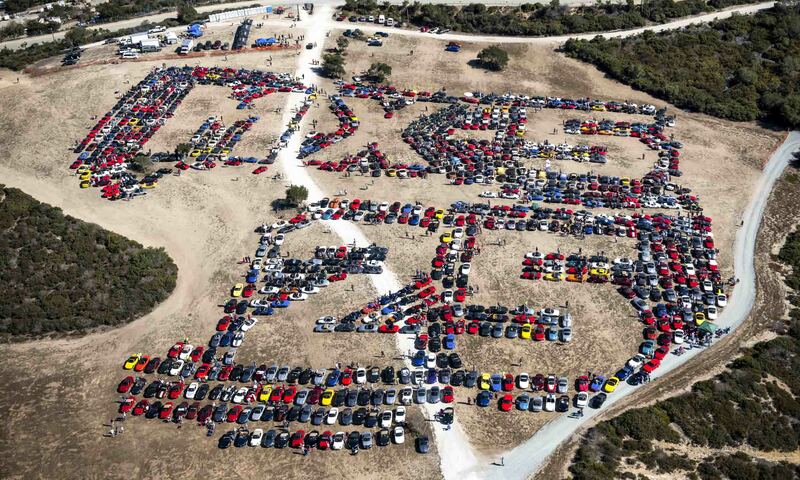 But car #17 went down a different path — one that many Miatas would take in the years to come. 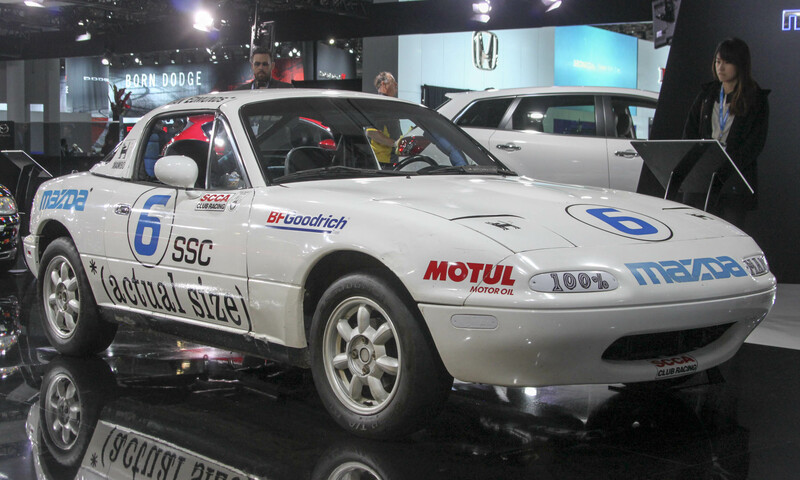 The first Miata to ever win an SCCA race, this car has never been driven on the road — all 6,500 miles on the odometer were racked up at the track. 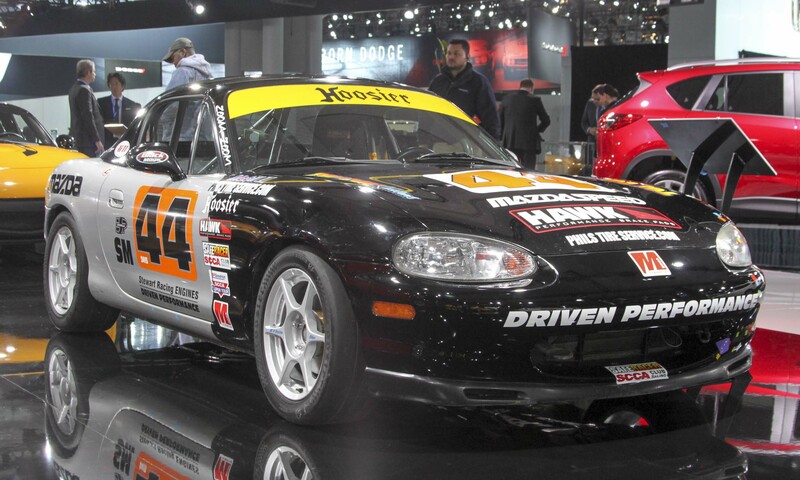 According to the company, there are more Mazdas road racing in the U.S. than any other brand of vehicle. 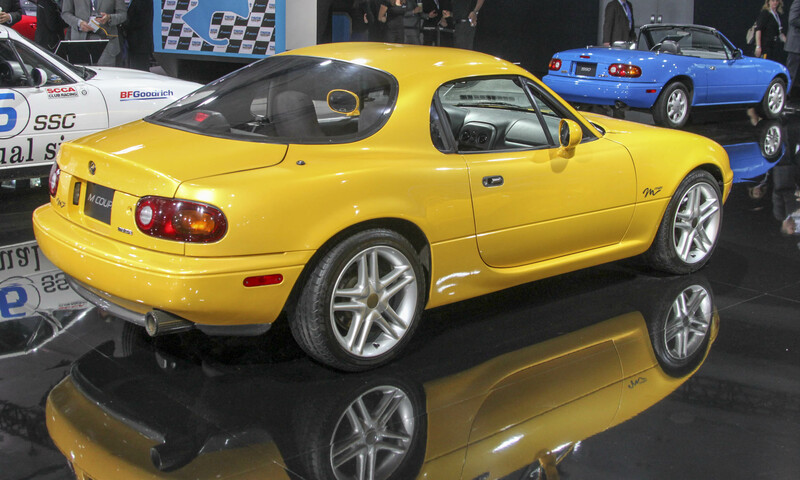 Mazda made it clear from the beginning that the MX-5 had the chops to be a racer — this Club Racer concept debuted at that same 1989 Chicago Auto Show alongside the new production roadsters. Designed to showcase the potential of the MX-5, the Club Racer concept features lowered suspension, fixed headlights and wider fender flares. This one-off concept still sits on the original Yokohama AVS tires it wore at the introduction. 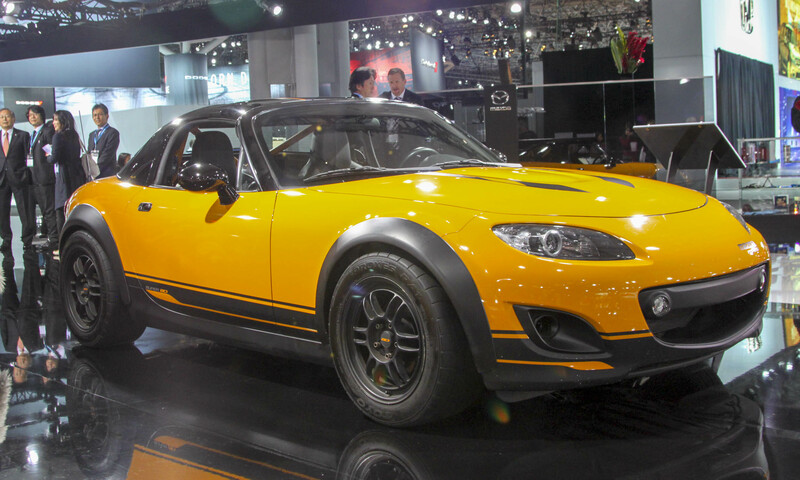 Six years after the MX-5 introduction, Mazda returned to the Chicago Auto Show with this sleek, powerful concept car. Designed to show a more musclebound Miata, the M Speedster has a chopped windshield, twin-cowl headrests, racing bucket seats complete with 5-point safety harnesses and aggressively-styled fenders. More than simply a styling exercise, the M Speedster is equipped with a Lysholm supercharger that bumps power to 200 horses. The suspension was upgraded as were the shocks, and the car sits on 15-inch alloy wheels shod with Z-rated tires. 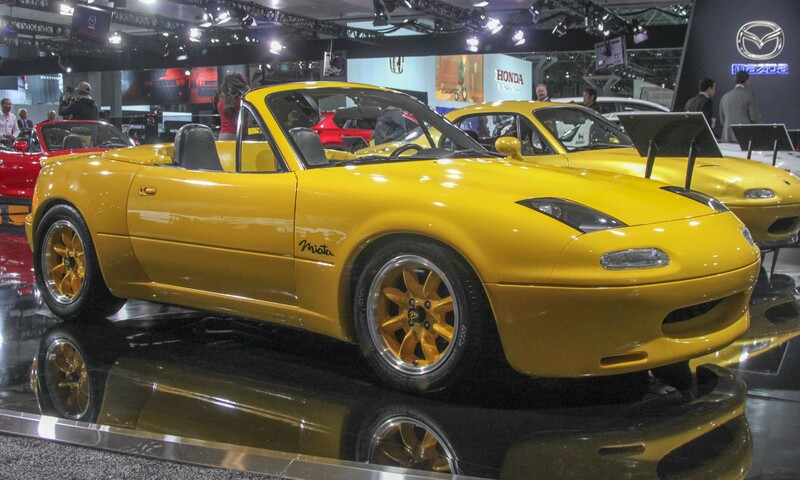 For the 1996 New York Auto Show, Mazda designers decided to see what the Miata would look like with a hardtop. The result is this unique concept that looks like a hatchback but still offers the cargo security of a regular trunk. Although the car was popular with show visitors, it never made it to production — part of what makes the MX-5 Miata the car it was and is today remains that thrill of open-air driving. To those who closely follow Miata history, this car is a bit of a unicorn. Mazda never produced a Miata for the 1998 model year — the first generation ran from 1990 to 1997, and the second generation started in 1999. This was in fact the only 1998 model — one car — built as a prelude to the second gen. 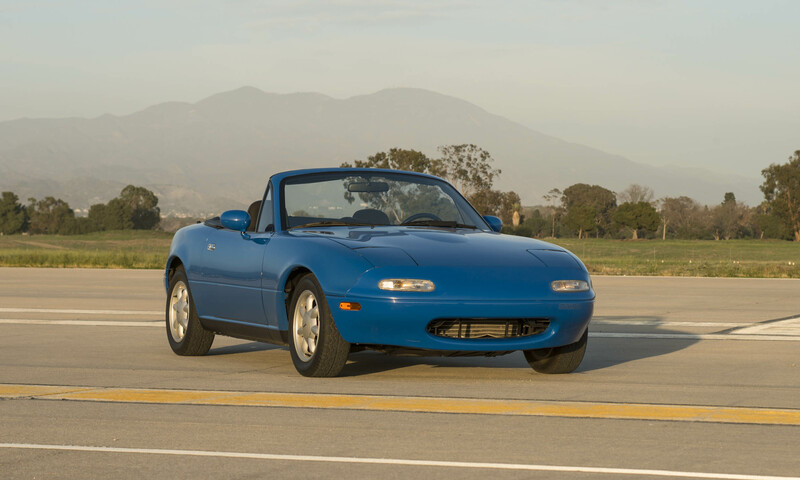 The 1998 Miata was built on the first-generation platform but showcased the styling of the new version that would arrive the following year. Engineers used this car to try certain design elements, including finding a way to make the trunk larger. This car never ran and was shortly followed by the all-new 1999 Miata. 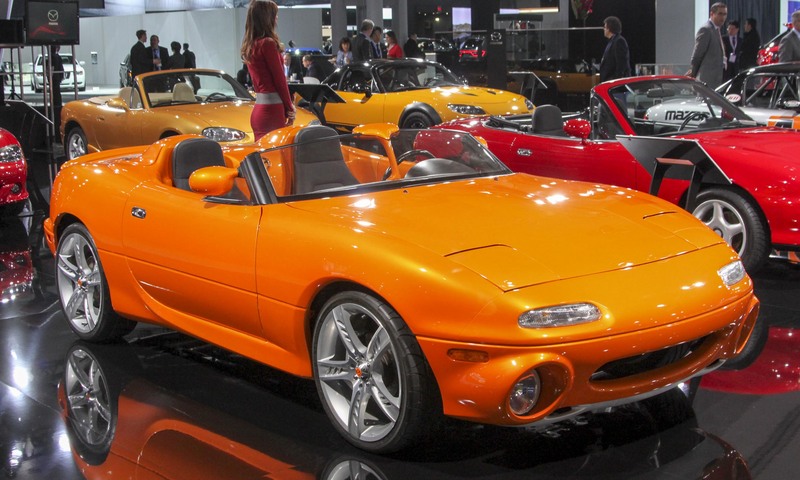 A little more than 10 years after the first Miata rolled off the assembly line, this 2002 model finished in Evolution Orange Mica was the 500,000th built. The second generation — the NB — debuted in 1999 with the most noticeable change being exposed headlights. That and other updated styling cues were heavily influenced by the third generation of Mazda’s RX-7, which was on sale at the time. This new Miata also got a bit more power, larger wheels and tires and more amenities than earlier models. A 6-speed manual was also offered for the first time. This car started life as an everyday driver for an owner in the northeast, but in 2008 it was transformed into this race car. All Spec Miatas are the same — only small modifications are necessary to turn this fun road car into a competitive track car. Like the others, this one features Bilstein shocks, Eibach springs and sway bar, a special cold-air intake and sports exhaust. 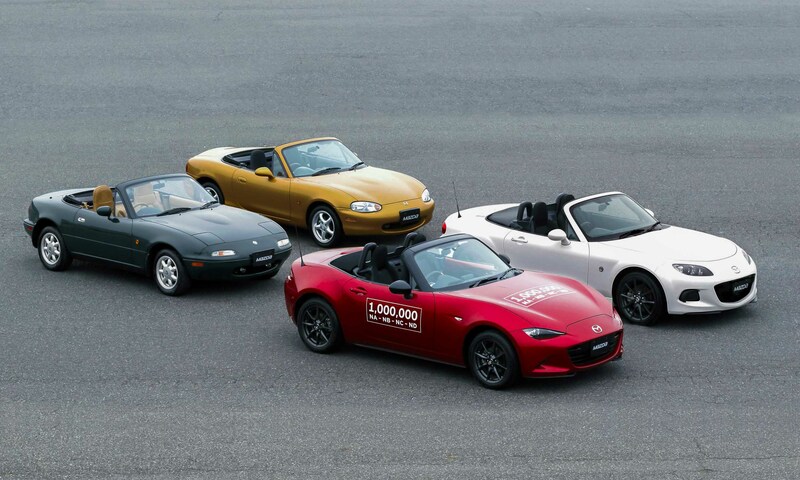 According to Mazda, there are more than 5,000 Miatas running on tracks around the world. This car was significant to Mazda for a number of reasons. The first turbocharged Miata, it was the most powerful version ever offered by Mazda at the time, sporting 180 horsepower. 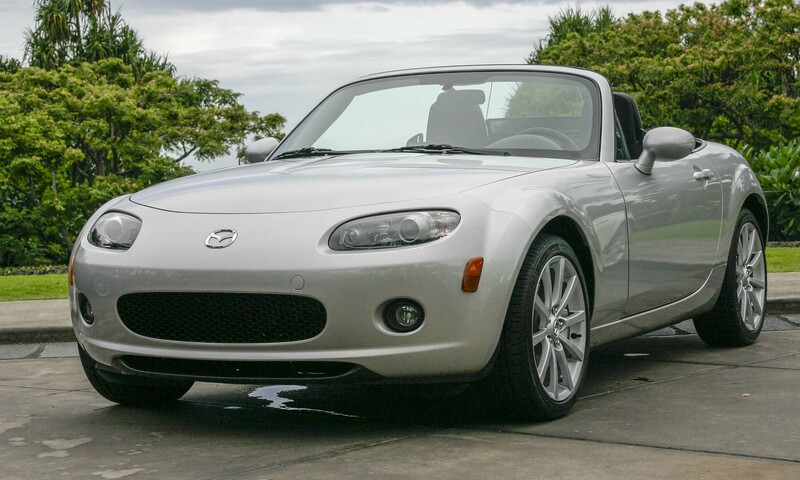 This is also the 700,000th Miata to emerge from the factory, and was the first to be sold without the familiar Miata badge on the back, only showing MX-5 as it is called in the rest of the world. 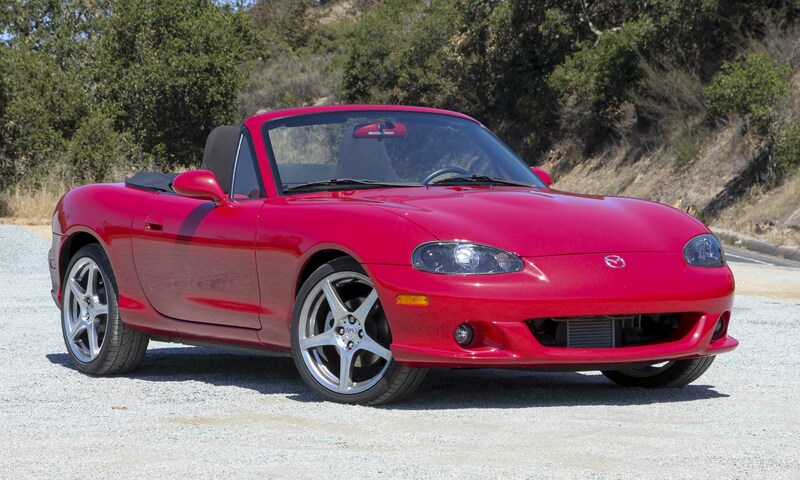 The MAZDASPEED MX-5 was built for two years, with a mere 5,142 produced. In 2006 Mazda introduced the third generation of MX-5 (the NC), revealing the larger, more refined roadster at the 2005 Geneva Motor Show. The new model also received a larger 2.0-liter engine producing 170 horsepower — up from the outgoing 1.8-liter 142-horsepower engine. Even though the car was larger in every dimension, Mazda stuck with the original formula of a lightweight roadster — the 2006 model weighed only a few pounds more than the second-generation MX-5. To illustrate how the MX-5 can also be the perfect race car, this concept turns half the MX-5 into a racer. Looking at the car from the right, it appears to be a stock MX-5, but with a roll bar, racing tires, suspension upgrades and racing seat on the left, it actually has two personalities. 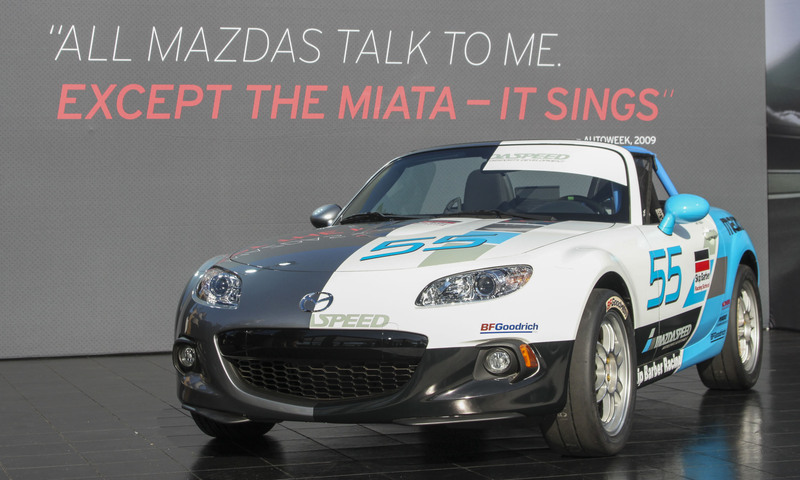 As Mazda puts it, there’s a race car inside every MX-5 just itching to get out. As much fun as this car would be, it is merely a show car created for the 2011 SEMA show in Las Vegas. The Super20 grabs attention with its Hyper Orange Mica paint, black Enkei wheels and wide Toyo tires. But this one isn’t simply a looker — under the hood is a supercharged engine generating more than 250 horsepower. 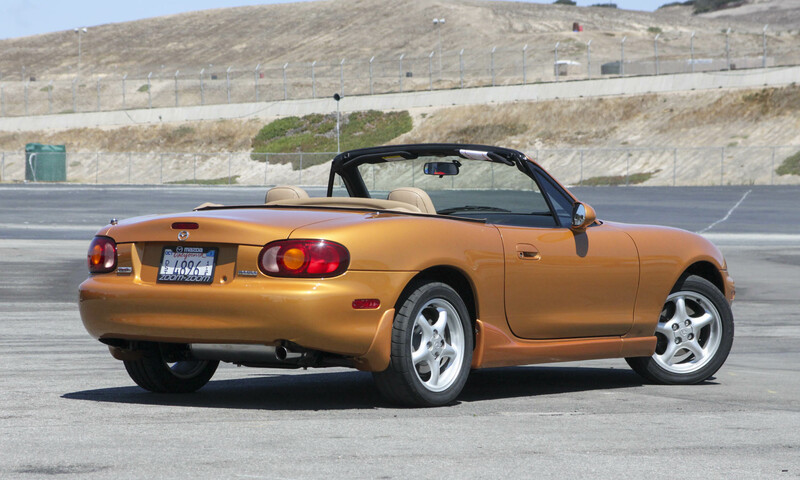 A few auto magazines tested this one, and at the time claimed it might be the ultimate MX-5 Miata. Twenty-five years of MX-5s was definitely something worth celebrating, and Mazda did just that with a special MX-5 25th Anniversary Edition. This limited edition MX-5 was only available in Soul Red Metallic with contrasting Brilliant Black A-pillars, windshield surround and black power-retractable hardtop. Seventeen-inch gun-metal gray wheels complete the look. Inside, the Almond leather trim with satin chrome finish fits nicely with the overall package. Just 100 of these Anniversary Editions were built. 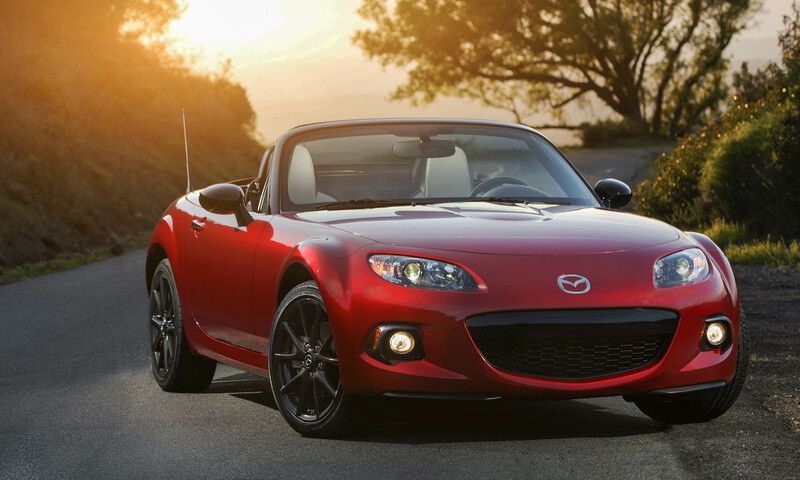 Mazda introduced the fourth generation of the MX-5 (the ND) in 2015 as a 2016 model with a completely new look. Yes, some iconic elements — such as the wide grille — are incorporated into the new model, but the headlights, taillights and integrated fender flares are unique. Of course, the new MX-5 followed the same basic formula of being lightweight, balanced, rear-wheel drive and open top — and it certainly retained the fun-to-drive factor. Power output dropped to 155 horses from the SKYACTIV-G 2.0-liter DOHC 4-cylinder engine, but with the reduced weight and more favorable torque curve, performance remains impressive. 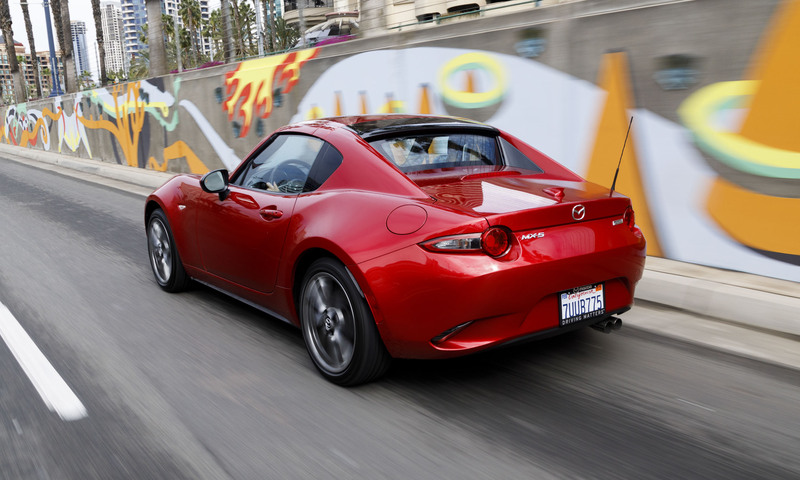 After many inquiries from enthusiasts about the option of a retractable hardtop, Mazda responded with the all-new RF. New for the 2017 model year, the MX-5 RF is a retractable fastback with a power-folding hardtop that can open or close in 13 seconds. Although a power-retractable hardtop was offered for the third-generation MX-5, the new MX-5 RF features a fastback coupe design with cleverly disguised cut lines at the base of the roof that allow the rear section to raise up while the front section and rear window are stowed, then return to position for a different open-top experience. 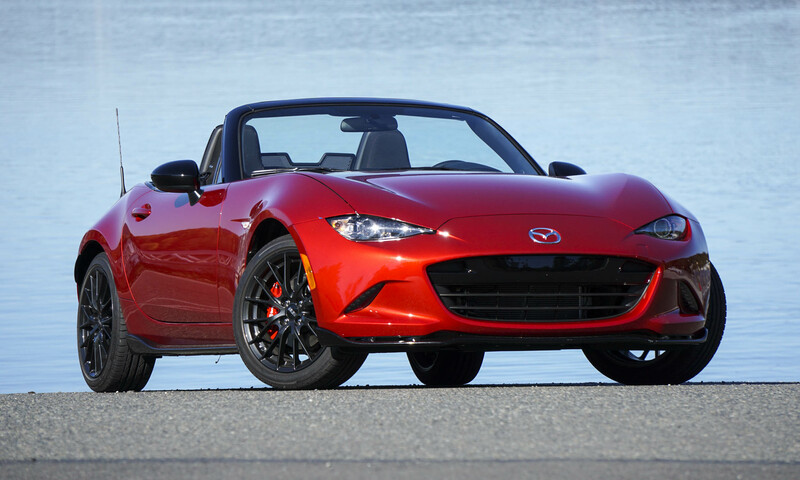 On April 22, 2016, the one millionth MX-5 rolled off the assembly line. 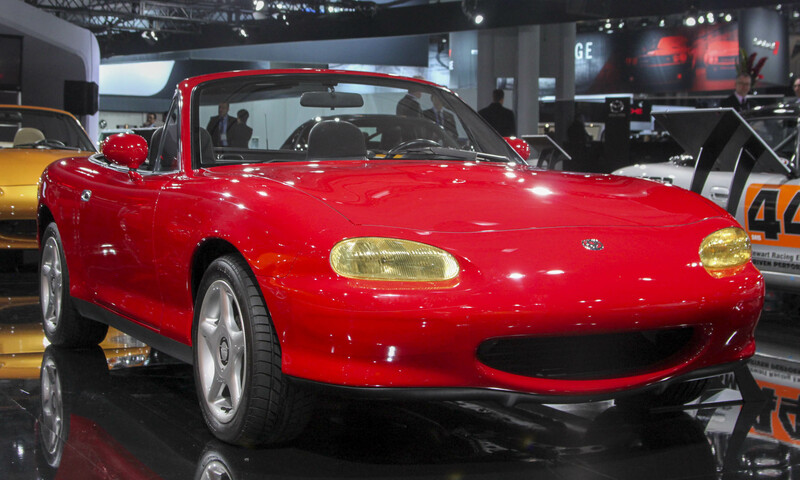 This came almost exactly 27 years after production began for the MX-5 at the Ujina Plant No. 1 in Hiroshima. “From the first generation through to today’s fourth-generation model, the reason we have been able to continue selling the MX-5 all these years is due to the strong support of fans around the world,” said Masamichi Kogai, president and CEO of Mazda Corporation. 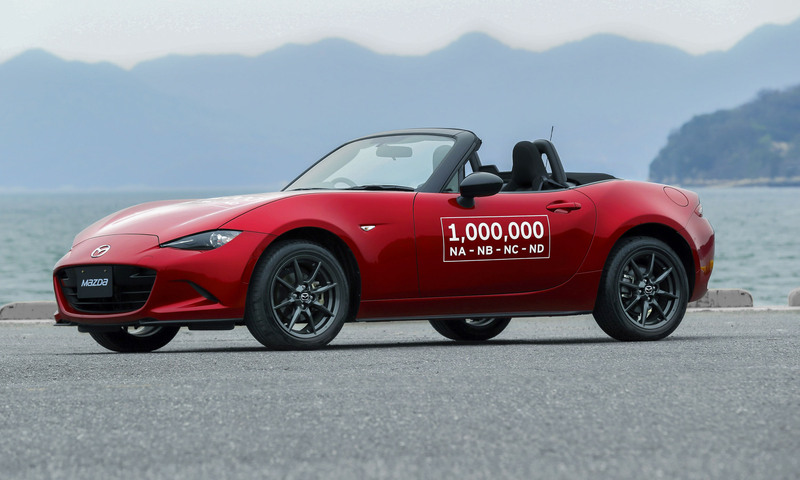 As a way of giving back to the fans, the one-millionth MX-5 was not sold — it went on a world tour and owners were able to autograph this noteworthy vehicle. Thirty years after making a big splash at the Chicago Auto Show, Mazda came back at the same venue to make even more waves. To properly celebrate this momentous milestone, Mazda introduced a special 30th Anniversary MX-5. 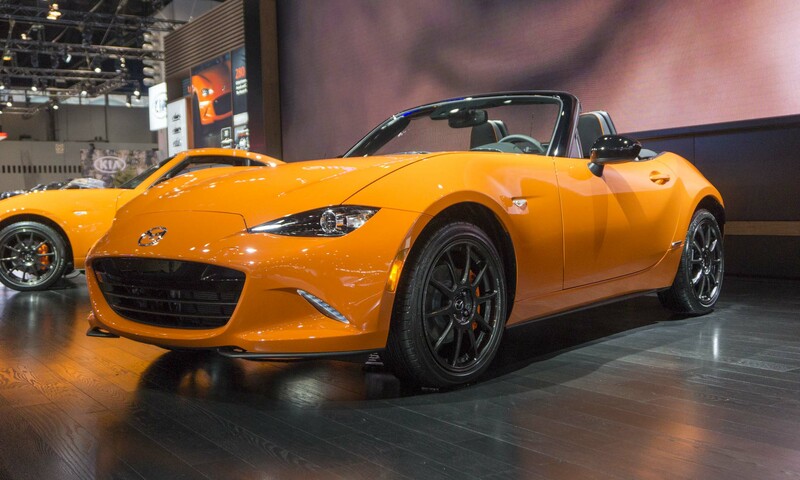 Sporting a unique paint of Racing Orange, this special roadster is equipped with forged-aluminum wheels developed exclusively for the MX-5 by Rays Co., Ltd. There are also orange brake calipers, orange interior accents, Recaro seats, Bilstein dampers and a Bose audio system. Only 3,000 will be sold worldwide — a combination of soft-top and RF variants — and all feature a 30th Anniversary badge with a serial number. Thirty years of the MX-5 never went so fast . . . cheers to 30 more! The post Happy 30th, Mazda MX-5 Miata! appeared first on autoNXT.net.